"Interior design is about respect for the identity of the building, its soul, which is often largely defined by its past. 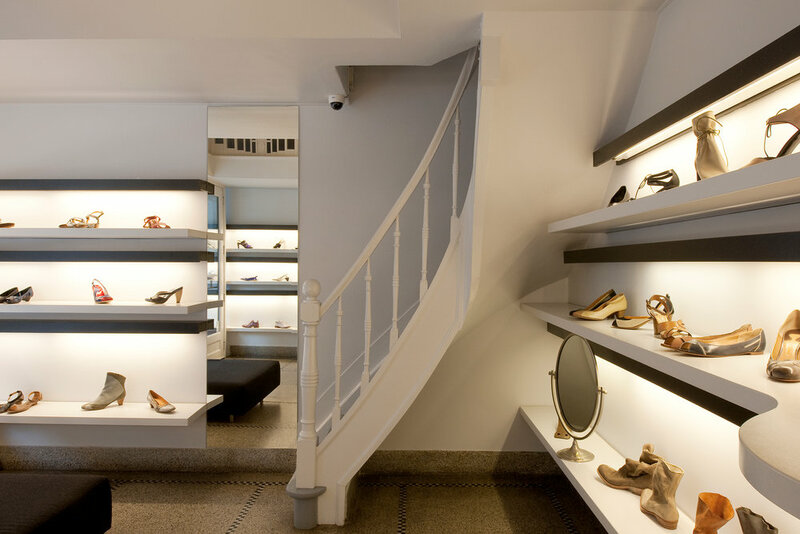 When my Brussels friend and colleague, Dirk Meylaerts and I were asked to refurbish this minuscule hat and shoe shop in the most fashionable street of downtown Brussels, the rue Dansaert, we decided to leave the original art deco interior untouched. We only added a series of shelves that swing like a loop along the walls and the window. They serve as a display and lighting source while leaving plenty of space in the middle and making the 10 sq m shop look even larger than it actually is." "While I would later design a shower where the water comes from underneath, the Man-Chi relaxation centre has a shower tube for power massage which has to be entered from above by using a small ladder. People see it as a typical Venlet intervention because of its position and cylindrical form. But sometimes the circumstances lend you a helping hand as originally the shower was not planned. Even its form was more the result of necessity and luck. In this case, as we were excavating to increase the ceiling height, we discovered a disused well in the basement. It was abnormally wide in diameter, 122 cm, so we decided to value that space and turned that deep hole into a power shower tube in the hammam. 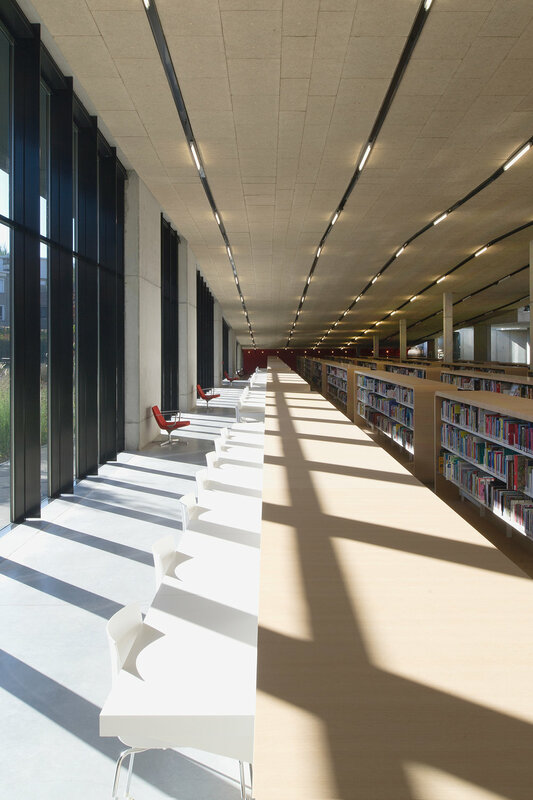 Man-Chi – which stands for Man-Health – is located in the heart of a fashion district in Antwerp, and the project evolved as the work progressed. What began as a small shop refurbishment of 50 sq m ended up as my first comprehensive project since my return from Australia, totalling 170 sq m. Man-chi relaxation centre now consists of four different areas. With its glass façade the small shop and lobby in front serve as a window display where everything is on show; even one of the Man-Chi chairs is strategically fixed to the wall, rotating at night. In this space, which doubles as a waiting room, one can also get a ‘quick over the clothes’ massage on one of the chairs. The rear space and basement that only became available much later, breathe a more Japanese Zen atmosphere, with three afrormosia wooden cubicle boxes aligned in the back. This is where men can enjoy in silent privacy a massage or foot reflexology. There is even a separate oriental shiatsu massage room. The presence of high design retail outlets in the surrounding area may partly explain why I opted for square forms and a more restrained style devoid of the curves and organic forms found in my earlier works. The simplicity and minimalism of each space and a judicious mix of materials, which is welcoming rather than intimidating, are designed to enhance the sense of serenity. There is an evolution from light to dark in the materials and colours used as you progress. The white walls of the shop and its brightly coloured furniture contrast to the deep natural tones of the afrormosia timber veneer applied to the exterior of the boxes at the back. The floor surface runs from cream epoxy to polished concrete and natural bluestone. 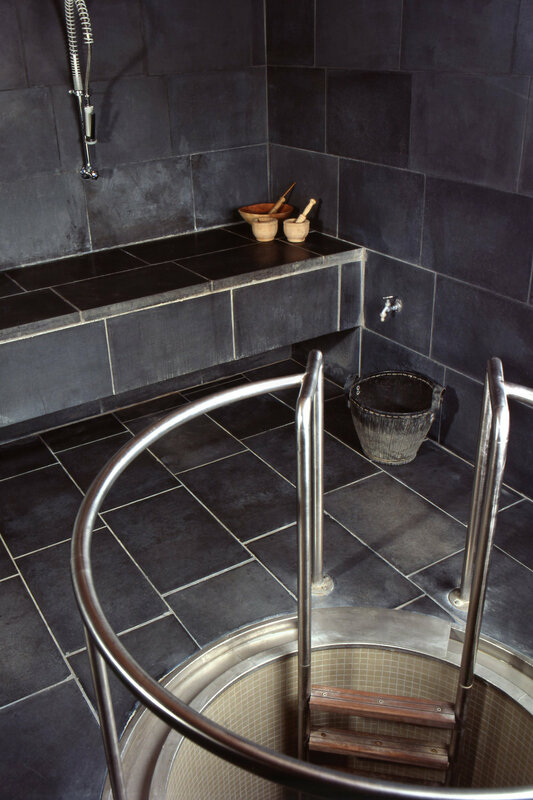 The wet spa room in the cellar is entirely made out of black concrete stone, instilling a calming darkness. Since the rear and the basement are a male-only zone, several masculine elements were injected in the interior. Inside the cubicles, that refer to crates, the walls are upholstered with the female side of Velcro, resembling a contemporary toolbox or well-organized garage, to hold anything from towels to massage oil." "From the very beginning my interior designs were constructed around objects that were especially designed for a project. In an otherwise minimalist and restrained approach, in which the space was reduced and stripped to an open plan with its bare essentials, the objects were meant to be strong signs characterising the space. Nothing should distract the viewer’s attention from the object’s quintessence. In a more general way, these objects were meant to function as a logo, providing the venue with a corporate identity. In Q Sydney, a bar on the third floor of three merged buildings in Oxford Street, dating from the beginning of the 20th century, the interior was mainly organised around two elements, or visual hubs, which I added to the otherwise empty space. 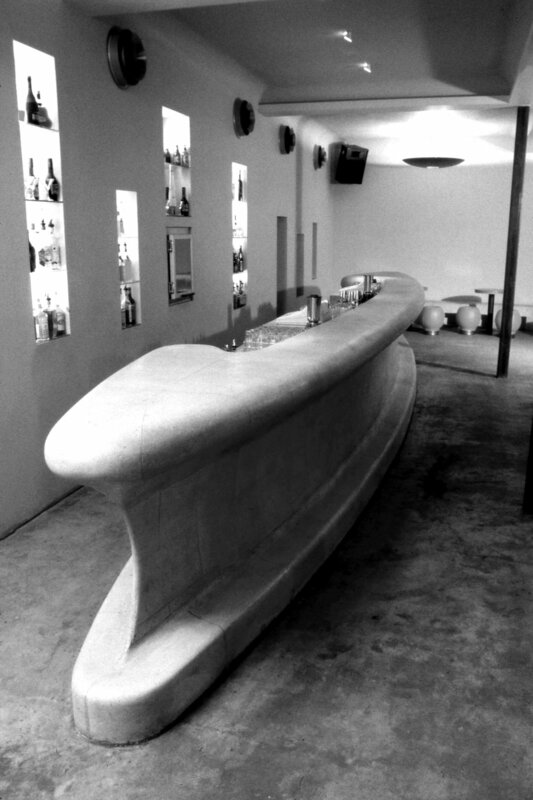 The main element of the setting was the counter, an oval when seen from above, and a 9 m long volume sculpted from lightweight concrete blocks. Its curved lines and fluid surfaces have later been associated with images of a marine world: from the keel of a ship to a polished pebble. I felt honoured, but in fact, its profile was mainly inspired by the postures clients take when hanging around and leaning on the counter top. While the refrigeration and stock were integrated in the block, I also created the possibility for clients to stand behind the bar next to the barman, knowing very well that only regulars would take advantage of this privilege. Even without the physical barrier, customers had to feel it was still there psychologically. It also created a round table effect, in which clients were not next to but facing each other. 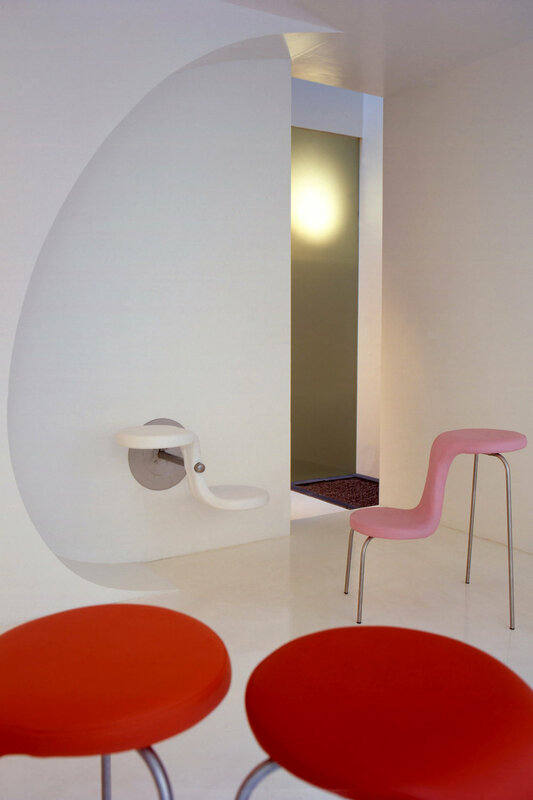 Stools – the second element – punctuated the space with a decisive note of colour. It was only after the success of Q Sydney that the owner decided to create a series of identical bars in Adelaide and Melbourne. The architectural language of Q Sydney served as an example but each kept its own individuality. While the form of the bar in Adelaide was much more rigid, the one in Melbourne went for the opposite. As a complement to the sturdy rectangular bar in Adelaide, sculpted in Y-tong blocs, the legs of three-penny-a-piece children’s chairs were heightened with tubes to create delicate bar stools. In Melbourne, the Q identity had to be added to the already existing and daring interior by the Australian designer Tom Kovak. I built a long curved bar that swung through the large open space like a giant spermatozoid, its tail ending on the dancefloor, creating a booth for the deejay. Again the clients could sit and stand on both sides of the bar. Regular clients could even leave their bottles in personalised safe-deposit boxes."